The annual UN High-Level Political Forum (HLPF) has a unique role to review progress, define policies and flag priorities at national, regional and global levels for implementing the 2030 Agenda for Sustainable Development and achieving the SDGs. This agenda has also become the premier driver and justification for institutional, financial and data reforms and capacity development. A number of decisions have been adopted during the twelve months since the last HLPF that are central to the implementation of the 2030 Agenda and the SDGs, particularly the measurement of progress towards the SDGs and strategies to finance them. They are complemented by or responsive to proposals of the UN Secretary-General on the funding and institutional architecture of the UN system. Download this Briefing here (pdf version). However, these developments are not prominent in the HLPF review process itself and are cause for concern as the current trajectories are inadequate to achieve the 2030 Agenda and do not correct the undermining of multilateralism. The 2030 Agenda is universal: its vision is inclusive of all countries, all policies, and all sectors of society. But evidence to date shows a pick-and-choose approach among some Member States, UN agencies, civil society and the business sector according to their priorities and interests. Efforts at implementation have not only privileged these diverse priorities and competencies but also have neglected accountability, deliberately or otherwise. While this approach may be understandable as it defines constituencies, resources and capacities, the aggregate does not do justice to the purpose of the 2030 Agenda, and risks re-writing it to a pale reflection of its ambition. The 2030 Agenda reiterates the need to progress beyond siloes and contains commitments aimed at addressing disparities in opportunities, wealth and power. Some laud the interest and involvement of the major economies / G20 and the corporate sector in the search for the ‘trillions not billions’ needed to implement the SDGs, but closer attention suggests the trillions may serve the needs of institutional investors and mitigate against the transformation needed to bring justice for people and planet. Currently the dynamics around measurement and finance are re-shaping the Agenda. Its bold vision is being undermined not only by what is and is not being measured and financed but also by a failure to focus on strengthening democratically accountable institutions as well as cross-goal, cross-pillar and cross-policy streams. This briefing introduces some of the recent developments in the areas of UN reform, funding and financing, partnership promotion and the measurement of “progress” on SDG indicators. Three years into the implementation of the SDGs, the indicator set that is currently being used as the basis for measuring progress fails to capture the holistic and transformative agenda envisioned by the SDGs. Instead of trying to find a synthetic dashboard that could summarize the trends in all key areas covered by the SDGs (social service delivery, inequalities, protection of the planet, prosperity) and show their trade-offs (e.g., prosperity versus planetary protection) and complementarities (e.g., access to water reduces the unpaid workload of women) the statisticians adopted a ‘count every tree’ strategy, proposing indicators for each of the 169 targets, without first assessing if a goal could be summarized by the sum of the indicators (which does not happen at all with, for example, SDGs 10 and 16) or data availability. The indicators have now been grouped into three Tiers, of which only Tier I has agreed methodology and sufficient data coverage; Tier II lacks sufficient coverage and Tier III still lacks methodological consensus. The upgrading of indicators into higher tiers has been a cumbersome process, yet in 2017 the General Assembly was asked to approve its continuation, so that it eventually might lift all indicators to Tier I, the only ones that can legitimately be reported. This could take decades and it de facto leaves the HLPF assessment of the 2030 Agenda without the needed data to show progress or regression (see GPW briefings #22, #23 and #24 for thorough discussion of these developments and their implications). Greater attention is needed to developments outside the UN that have the potential to marginalize or even reverse implementation of the SDGs, notably actions and initiatives of the G20, international financial institutions (IFIs) and multilateral development banks (MDBs), particularly in terms of financing and partnerships. The current dialogue around SDG financing is snared among fault lines that favour big corporations. It assumes the conventional wisdom that public financing is played out without any attention to how resources are diverted from the public purse by tax avoidance, evasion and illicit financial flows. It avoids analysis of the quality of public spending, the distributive and multiplier benefits and increasingly advocates the shift of public resources to leverage private flows. Moreover, it accepts unquestioningly the assertion by the G20 and the MDBs that US$ trillions are needed without clarifying the costing basis. Who will benefit from the mobilization of these trillions? Certainly, the pension funds and institutional investors that are awash with liquidity and searching for a pipeline of guaranteed returns. The urgency to attract the so-called ‘trillions’ – promoted under the call of Maximizing Financing for Development - has prompted a shift in the narrative from a focus on factors needed to create an enabling environment for states to implement the SDGs to a focus on promoting a business-favourable enabling environment, which often results in fewer regulations and oversight in relation to business activity. Modalities and innovations address how to incentivize private investment, including through the use of public finances. The UN is urged to convert development activities into a pipeline of bankable projects, embrace PPPs while avoiding the analysis of off-book liabilities that have turned this modality, on occasion, into a pipeline of debt creation and public service erosion. In its 2018 report, “Financing for Development: Progress and Prospects 2018”, the UN Inter-Agency Task Force on FfD provides key recommendations regarding the framework that is needed for private sector investment to be effective in advancing sustainable development. Chief among them is an acknowledgement of the critical need to shift from short-term to long-term investment horizons in decision-making. The report highlights that failure to do so could result in major risks, such as those from climate change, being left out of investment decisions. What is lacking, however, is an analysis of the opportunity cost of diverting resources from the public purse – resources that are essential for achieving the SDGs. Efforts towards global tax co-operation have stalled with the Platform for Collaboration on Tax (PCT), which has gained momentum and is being positioned on centre stage. This initiative reduces the UN to one of four players (alongside the World Bank, IMF and OECD) and is not accountable for SDG implementation. As noted by the Global Alliance for Tax Justice in a recent policy brief, “PCT statements have taken positions on issues where no UN agreement has been reached, including where a majority of the UN membership has expressed a different position”. This diversion of policy-making and implementation into other fora only partially if at all accountable to UN norms and values is a well-used tactic, sometimes justified by claims of capacity and competence. However, the IMF, the World Bank and the OECD participate actively in inter-agency groups such as the FfD IATF and the IAEG-SDGs. In the same way that the sought-for ‘trillions’ has been accepted into the discourse, so too has importance of multi-stakeholder partnerships for SDG implementation. Member States and the UN accept that a new approach is needed. What is missing from the current dialogue, however, is an assessment, before all else, of whether or when the partnership modality is relevant to SDG implementation. Furthermore, if the partnership modality is deemed relevant, a new UN approach is needed in order to go beyond the narrow, or siloed, pre-2030 agendas of individual agencies to incorporate system-wide agreement on a set of rules and guidelines. These would be carefully designed to ensure the quality of any multi-stakeholder collaboration, such as those for inclusion or expulsion, conflict of interest and risk assessment, among others. The Secretary-General’s proposals on UN reform stop short of addressing existing institutional gaps that detract from the potential of UN-led partnerships to contribute to the successful advancement of the SDGs, and instead risk having the opposite effect. The establishment of an independent UN Office of Risk Management would go a long way to separating oversight from promotion functions. To avoid conflicts of interest, oversight and verification of due diligence and integrity measures cannot be performed by the same agencies and/or unit(s) tasked with promoting and engaging in partnerships (for a more detailed discussion of the pre-conditions for effective partnership engagement, see GPW Briefing 24, “The Semantics of Partnership”). The UN system currently relies on just three governments (the US, UK, Germany) for 45 percent of all its funding. The past two decades have seen a marked shift from a more or less even split (50/50) of core and non-core resources to the current “pay-to-play” ratio of 20 / 80 core and non-core with 91 percent of non-core funds being strictly earmarked. To enable the UN to secure impartial and quality capacity to support SDG implementation necessitates a move away from this pattern of a strictly earmarked and donor-driven approach to funding. 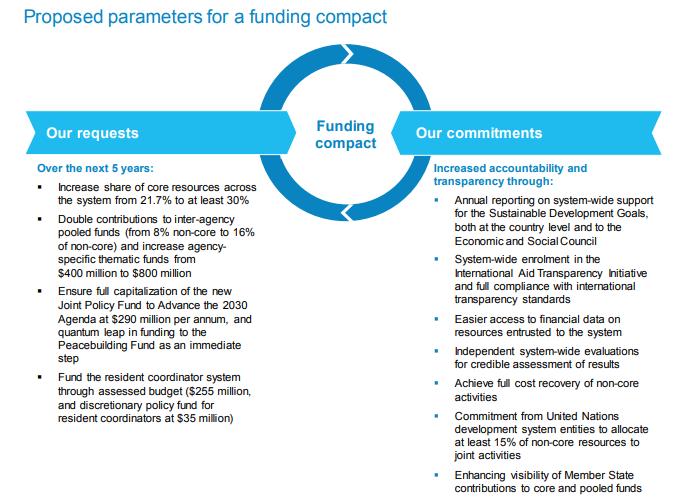 (For an analysis of UN Development System funding see “Fit for Whose Purpose? Private Funding and Corporate Influence in the United Nations,” Global Policy Watch, September 2015). - From the Report of the Secretary-General, “Repositioning the United Nations development system to deliver on the 2030 Agenda: our promise for dignity, prosperity and peace on a healthy planet” [A/72/684-E/2018/7] – December 2017. How to balance diversification to reduce the influence of a few big-state donors without adding only a few big corporate or philanthropic donors? The HLPF has become a magnet and a marketplace for all manner of initiatives. It will meet in 2019 at summit level and will be confronted with the growing evidence of being off-course for 2030. This is an essential occasion to address the obstacles to achieving the SDGs. If the Heads of State and Government do not chart a correction course, it is time to consider what really lies behind their championship of the SDGs. By Barbara Adams and the GPW team.